Ooooh, I love this! It´s so much fun to look at. At first I thought they were real baby socks, and I had to laugh out loud! What an idea! Especially love the fancy fox – very nice! OMG – I LOVE it! I, too, always try to figure out what it makes me think or what the artist was thinking (like our buddy, Jo), but I am learning to just go with it, enjoy it for what it is, and not worry so much about what it means. Let’s just have fun… and DANCE! 🙂 Happy Weekend Laura! Thanks, Jodi! I’m so glad you love this, it was so much fun to do! Put on your red shoes and dance the blues, lady! I like the freedom in this. It’s inspiring for me to bust it out a bit. By the way, where is your traditional call to the Friday dance? Didn’t I cue the dance at the bottom? Eek, I better go check! Yay for freedom!! Ooh, I’d love to see you go abstract with all those Blick supplies! Did you make it back there yet? Yes. I bought a couple of Micro pens. I’ve not used them too much. It’s too easy to drop by Blick on the way to somewhere else. They seem to have absolutely everything. I can’t even imagine the levels of arty goodness I’d imbibe from just one store visit!! Oh, so dangerous, good thing I have none close by. You’re so lucky!! Ah, I’ve seen those socks before! And I’ve wanted to buy them! Thanks, Jo! You rock at it! Thank YOU. Once I did. When you have a moment go into my archives. You have to scroll down and click on the ” +” symbol at the bottom of the page). You’ll see a calendar there. Check out February 1st’s record. Your collage is so playful and FUN! YAY! 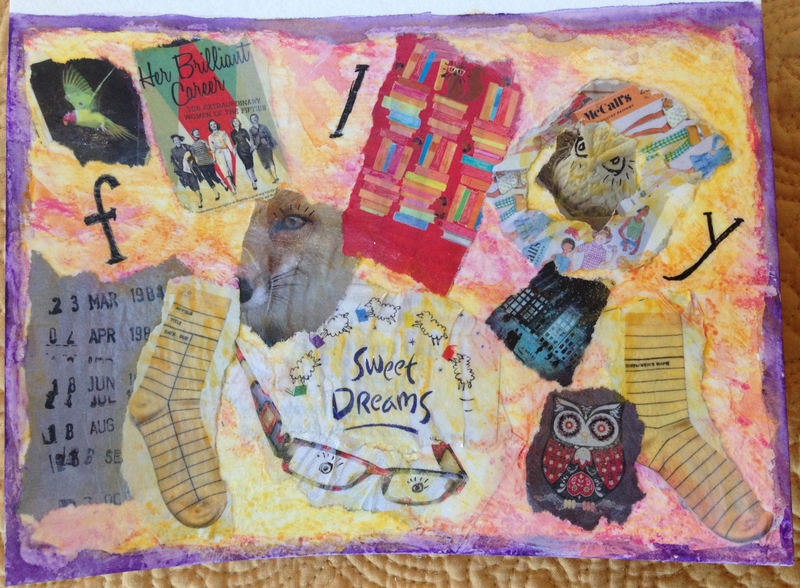 This is what I like best about collage – no rules! I see a couple of sweet owls peeking out too. Happy Friday! Thanks, Margaret. It was fun!